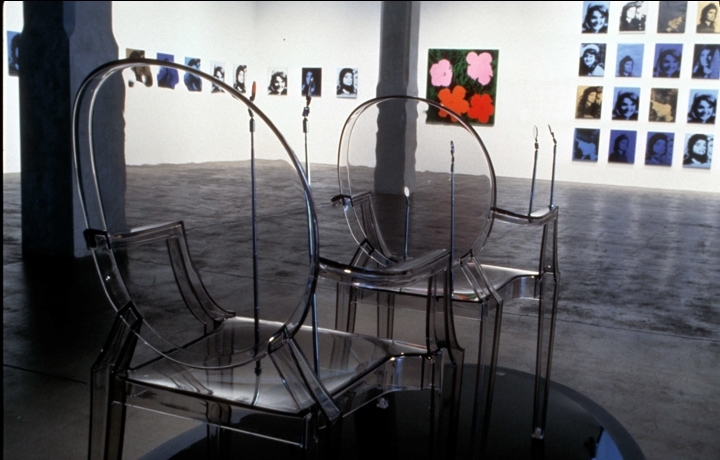 Nexus 40: November 22, 1963 was created in commemoration of the 40th anniversary of the Kennedy assassination and exhibited in the show November 22, 1963: Image, Memory, Myth at the Andy Warhol Museum in Pittsburgh, PA. Two clear acrylic Louis XVI-style armchairs rest on a dark oval acrylic base. The rear chair rests over a stylized presidential seal with 13 stars. Small mirrors attach to the chairs in locations corresponding to the path of the so-called “magic bullet” that passed through JFK and Gov. Connally. A red laser hits the first mirror and is reflected from mirror to mirror along the bullet trajectory. The styling of the chairs is elegant and powerful, reflecting much of the aesthetic of the Camelot Era, an era that retains a cult-like fascination to the present day. Public fascination with JFK, his presidency, the Camelot era, and the assassination retains its intensity 40 years later. Nexus 40:November 22, 1963 explored, both through its form and its context within the exhibit as a whole, what can exist at the intersection of what we see, what we think, and what we believe.